How much harm will “business as usual” cause? It’s tempting to think the damage will be small. After all there was a 0.7 degree centigrade rise over the last century – a time of many disasters both natural and man-made – but none blamed on global warming. Most models predict perhaps another 1-2 degrees in the next fifty years, and maybe a couple more by the end of the century. Sceptics say resourceful humans will cope. We will, but that doesn’t mean it won’t be costly. Sceptics also emphasise the winners and losers – costs to some from rising sea levels, and benefits to others as warming brings unusable land into cultivation. It’s unlikely that the present planetary temperature is absolutely optimal for human welfare. Again the sceptics have a point, but the transition will be harmful. A world with sea levels a few meters higher or lower would be fine if it had always been like that, but we can’t easily move cities. Nor can the natural world easily adapt. There will be species loss along the way. And the specific local risks are alarming. It’s not just sea level rise, and extreme weather events. Loss of the Andean and Himalayan glaciers, which provide freshwater to millions, the drying out of the Amazon basin, shifts in the Gulf Stream altering Western Europe’s weather. They won’t all happen, maybe none will, but even optimists agree there’s a significant probability that some will. The Stern review attempted to put a cost on all this and came up with a figure of 5% of world GDP lost every year forever, if we continue business as usual. The problem for planners is that different forecasters give different estimates. The graph below is the sort I can understand. This graph pools various estimates of the net costs of business as usual into a single estimate and confidence interval (left), and compares this with the best estimate and confidence interval from Stern. I’m not qualified to judge who is correct but it’s obvious that the Stern review is at the pessimistic end of the range. 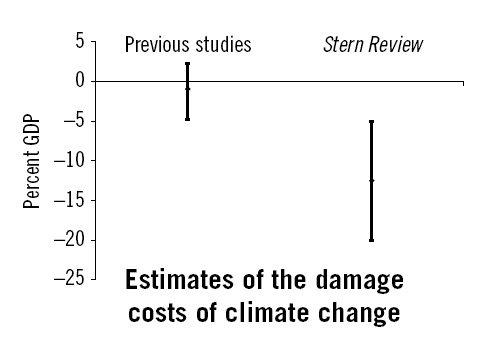 Source: Tol & Yohe (2006), “A Review of the Stern Review”. World Economics 7 (4): 233–50. Access here. He chooses pessimistic assumptions. He may or may not be correct, but compared with other forecasters he is pessimistic. He intentionally does not account for human adaptation. He has his methodological reasons, but this distorts his cost estimates upward. A couple of examples; the costs of losing fresh water consequent on glacial thawing, and of treating additional diarrhoeal disease and malaria. Both are nasty and costly, but they are also eminently adaptable to, especially if the affected countries experience even modest economic development. Finally, and most controversially he chooses a very low discount rate. This matters because the damage of warming will occur in the future, but we are being asked to spend money now to prevent it. £10 now is worth more than £10 in 20 years, because you can invest £10 now at say 3% annual interest and end up with £18 in 20 years. Future costs should therefore be discounted by a certain amount each year. The higher the discount rate the less we should be prepared to spend now to avoid the future cost. Stern chooses a discount rate of 1.4%, which strikes me, and most commentators, as ridiculously low. Most other experts choose rates of 3% or more. There remains plenty of room for serious debate about the costs of business as usual.